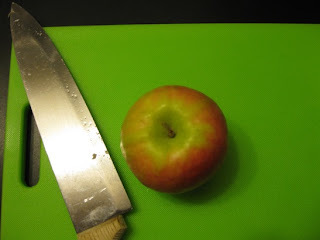 My good friend, Jennifer Smith, introduced me to the best apple in the whole wide world. The Pink Lady. She's a cross between Golden Delicious and Lady Williams. Like a true lady, she has a natural pink blush. Like me, she is sweet, but tart. She was developed, quite recently, by the Dept. of Agriculture in Western Australia. 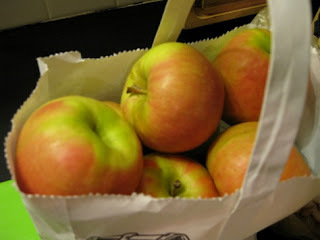 Jenn got her Pink Ladies from the Carver's orchard in the Tennessee mountains, Cosby, TN, where she also found a high school for her husband to transfer to so Jenn can move & see more snow & more apples. The best thing to do with the Pink Lady, as with any lady, is to love her as she is. However, if you, like most men, must change the lady, here are some ways to alter her, a few interesting recipes, none of which have I tried; you're going solo on this one, I cannot be a part of altering The Pink Lady. Go get you a bagful and fall in love. I'm glad you liked them, i need more, im out!